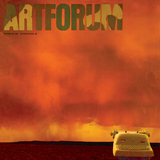 Artforum has always acknowledged the seminal role of artists who are also critics. We are fully confident of Mr. Lawson’s position within this tradition. Because such a position can be complex, it must be noted that several of the artists illustrated here exhibit with the same gallery as Mr. Lawson.